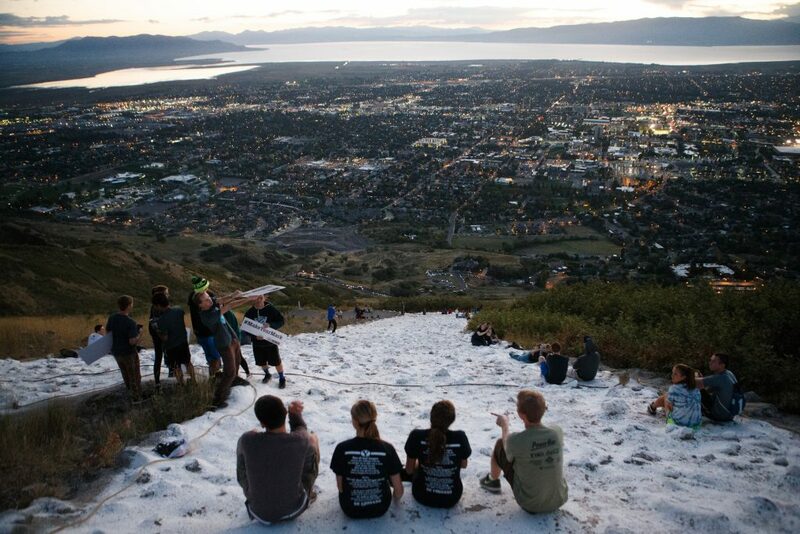 The BYU Football team runs the hike, Alumni make the trek, and thousands of local residents hike The "Y" to watch the sunset over Utah Lake and the Oquirrh Mountains to the west. 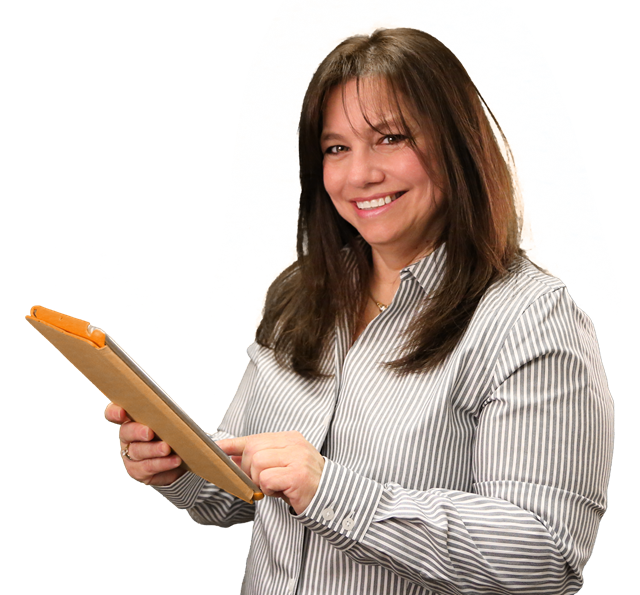 ​From 900 E, turn east onto 820 N. As you follow 820 N it will transition into Oakmont Lane. Turn right on Oak Cliff Drive to Terrace. Turn left on Terrace and follow signs to parking lot. ​The Y measures 465 feet tall by 168 feet at the widest point. 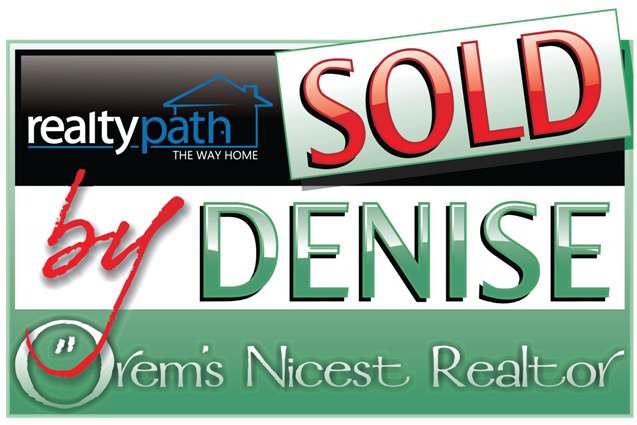 In all, it takes up 32,847 square feet. The hike is 1.2 each way from the parking lot. 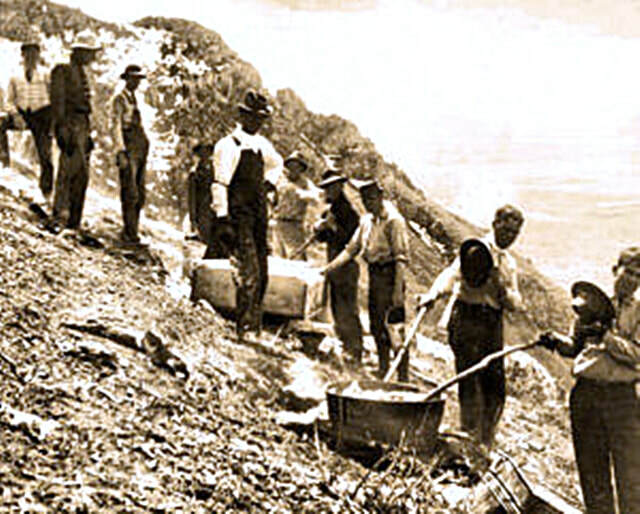 In the spring of 1905, freshman and sophomore classes at UC-Berkeley had cooperated to create a 70-foot "C" in the Berkeley Hills, just in time for the school's annual Charter Day celebration. 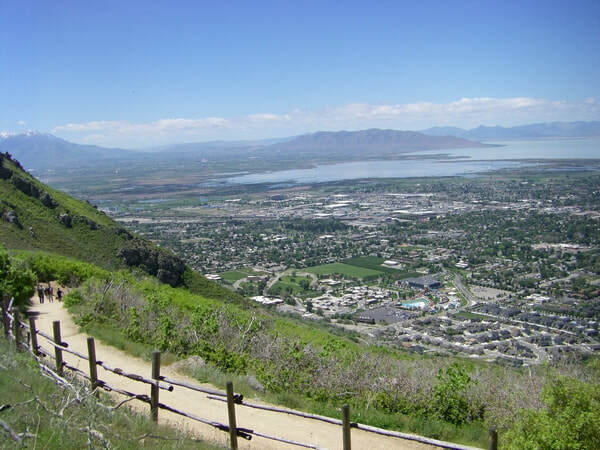 Brigham Young High and BYU faculty members who took classes in Berkeley that summer saw the giant "C" and returned home talking about the possibility of placing large B-Y-U letters on the mountainside above Provo. High school and university leaders seriously began to consider the idea of painting the school initials on the mountainside in a dignified, monumental manner. They hoped this would unite the classes, and forestall graffiti vandalism by future class rivalries. Professor Ernest D. Partridge was asked to design the emblem and supervise its survey in 1906. He had taught Brigham Young high school and collegiate students in mathematics, agriculture, and theology since 1897 and was an expert surveyor. 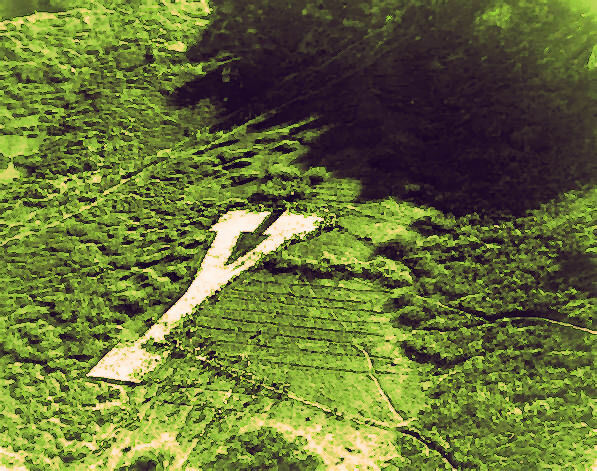 From the air, the letters would appear elongated, but they were intentionally designed that way to look normal from the valley floor. 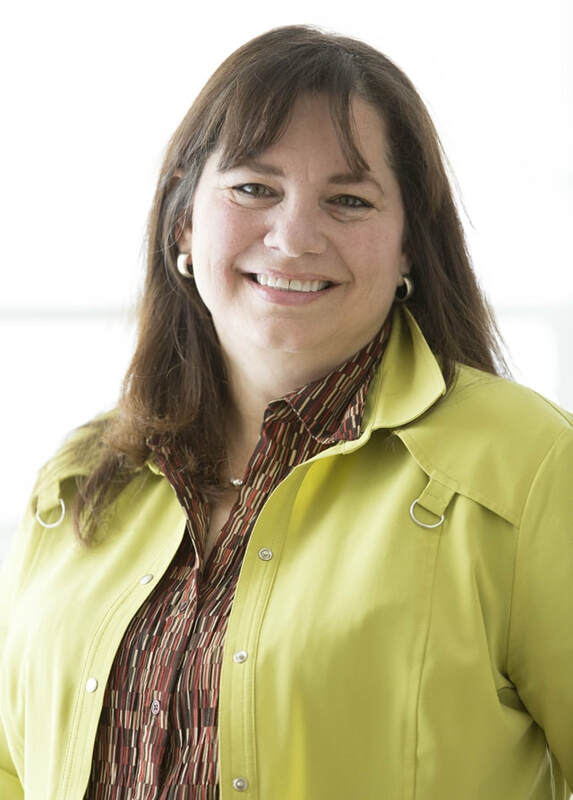 ​"The students stood in a zig zag line about 8 feet apart stretching from the bottom of the hill to the site of the Y. The first man took the bag of lime, sand or rocks and carried it 8 feet and handed it to the next man. The second carried it another 8 feet and handed it to the third man and thus the bag went up the hill, each man shuttling back and forth along his 8-foot portion of the trail. All the students started with enthusiasm as they expected to be through by 10 o'clock a.m. But it was a much bigger job than anyone expected. It was 4 p.m. before the Y was covered, and then only by a thin layer. So no attempt was made to cover the other two letters." "​It was very hard work and most of the boys had had no breakfast and no dinner. No one dared to quit as it would break up the line. In the afternoon it was more than some of them could take and they fainted and had to be helped down the hill." ​Hoping to make it more permanent, a layer of rock was added in 1907. 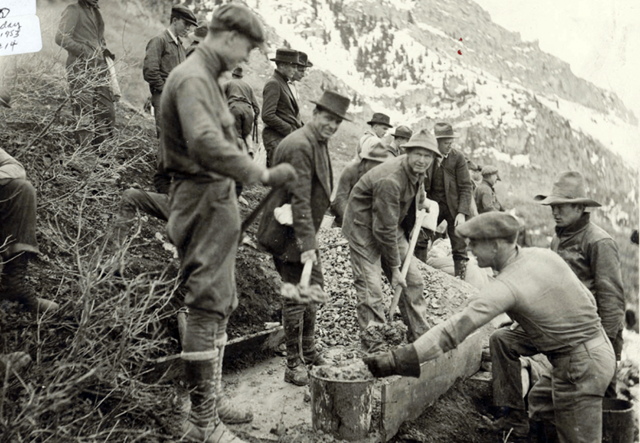 The next year, 20,000 pounds of sand and cement were carried up the mountain to form a three-foot high wall around the letter to hold it together. The original "Y" letter was a plain font. In 1911 it was made into a block "Y" with the addition of serifs at the tops and bottom, forming its current appearance. 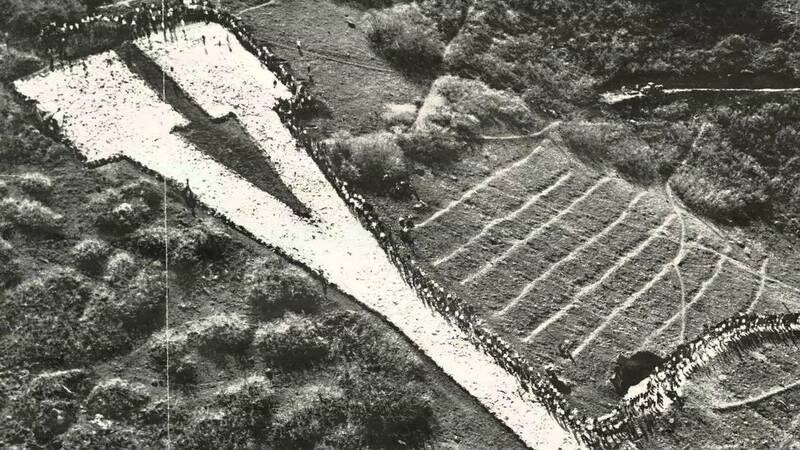 For over 60 years, students formed a human chain from the base of Y Mountain to the "Y". 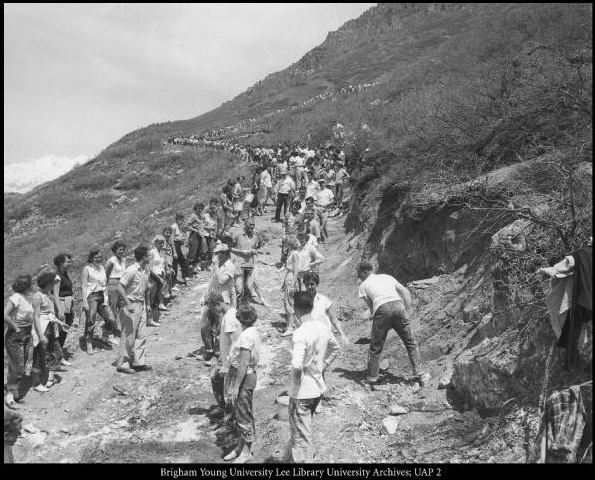 Every year the Y" was built up a little more with stones and cement, then whitewashed by thousands of students hauling thousands of gallons of lime mixture up the mountain using a bucket brigade. The mixture required 500 pounds of salt, 110 bags of lime, and 3,000 gallons of water. From 1911 to 1971, students observed and celebrated “Y Day” in the springtime by forming a bucket brigade and whitewashing the Y.
Freshmen would haul water from a spring. Sophomores carried the whitewash and mixed the substance in wooden troughs. Juniors and seniors would pour on the liquid. They passed a mixture of water, lime, and salt from hand to hand until it reached those assigned to spread the whitewash. Beginning in 1972, helicopters were used to transport the whitewash to offset the wear and tear on the mountain. This lasted through 1978 when it was discontinued. In 1978, BYU applied gunite, rendering the annual whitewashings obsolete. Gunite is a mortar that is sprayed pneumatically onto surfaces at a high velocity. Gunite or shotcrete material is mortar or small-aggregate concrete applied using a wet or dry process. 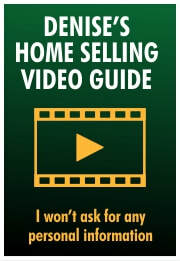 Once gunite has been applied it starts a simultaneous process of consolidation and settling. ​A fresh coat of paint — 155 gallons’ worth — has been applied every few years so the Y can maintain its white appearance. 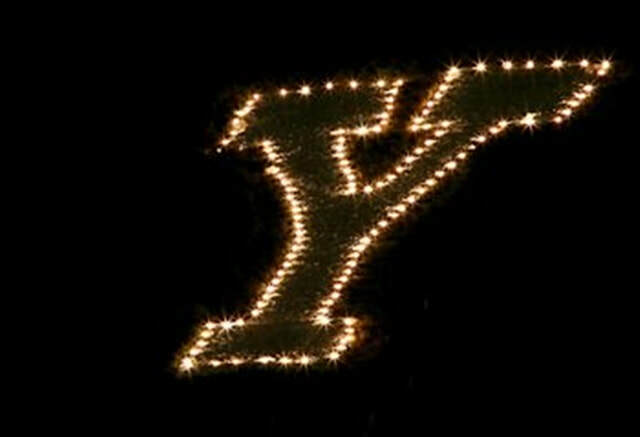 History of "Lighting the Y"
1985: Strings of electric 25 kw bulbs were lined around the Y, powered by diesel generators, allowing the monument to be lit for several nights in a row. Brigham Young University has become the sole owner of its signature landmark — and all it took was $180,000, four years and an act of Congress. With Y Mountain now the exclusive property of the private Provo school, students, alumni and outdoors enthusiasts are celebrating. 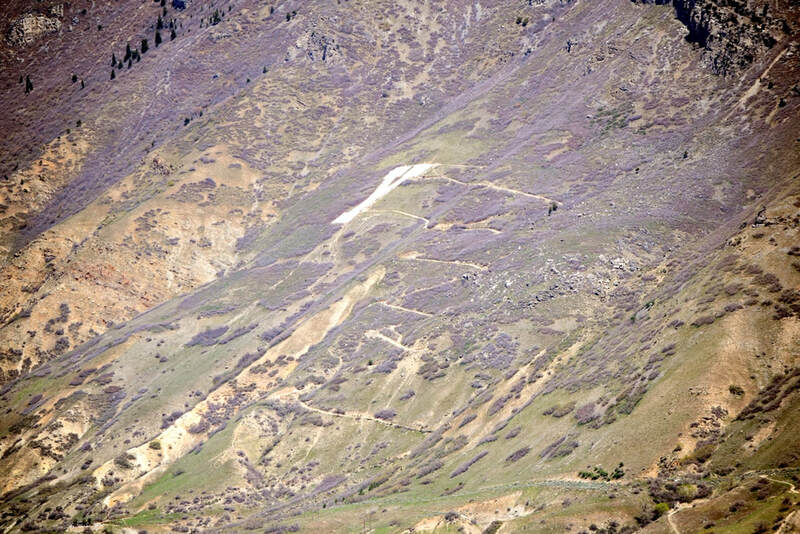 The transfer of land-ownership from the U.S. Forest Service to BYU improves safety on the steep one-mile path that leads to the block letter.